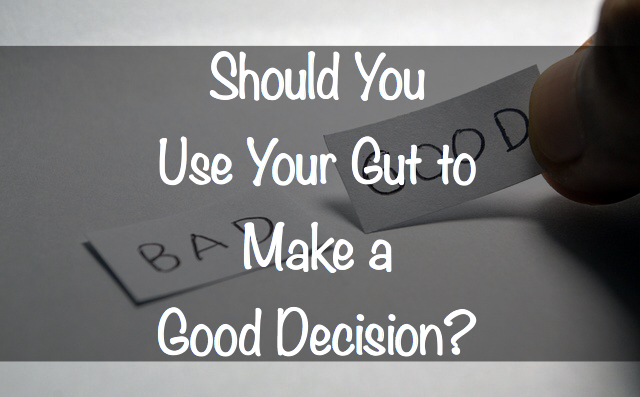 Should You Use Your Gut to Make a Good Decision? I have long operated with the philosophy that when my gut tells me “no,” I listen. When it tells me “yes,” I look for another supporting data point before moving forward with an affirmative decision. And that’s because sometimes when my gut says “yes,” I want to make sure it’s not because I want something so badly that I’m willing to overlook risks. As much as I rely on data analysis to make decisions, I still believe that instinct plays a role. So when I’m looking at making a decision, I rely on both the data and my 20 years of experience. And the more experience I have in a particular area, the more comfortable I am relying on my gut. I had this situation come up the other day. As you know, I’m currently looking at a few companies to acquire. The most recent company that I’m evaluating has a few red flags. While revenue has been up and down over the past few years, it’s been mostly down until the last few months when it suddenly began increasing. During that same time, the company had a change in senior management and it appears they’ve been cutting other staff as well. While revenue growth is up the last few months, gross margin is down. It appears that they’re buying and reselling product at a loss to make their revenue look better. To cover the shortfall in gross profit, they’re including the previously mentioned declining staffing expenses in cost of goods sold which artificially makes gross profit appear to be increasing. Obviously, this bothers me because it appears they’re trying to hide the true results of an underperforming business. Over the years, I have acquired businesses that were struggling. In fact, buying a business when it’s down can be a good strategy. For the most part, owners don’t sell their company unless there’s a problem. The problems can range from increased competition to tax problems to management problems. And while there are instances when owners want to retire, despite what they are saying, this doesn’t appear to be the case in this situation. Readers, do you rely more on your gut or on data when making a decision? How do you learn to trust your gut? I like your strategy FS. Go with the gut feel but back it up with supporting data. Now I must admit that I haven’t done this myself on many an occasion and sometimes I get lucky and everyone is happy, and others, it’s led to suffering of some kind. I have learnt, through experience, to slow down and not make impulse decisions even though it’s sometimes hard not to say ‘yes’ in the heat of the moment. My advice is that the quicker someone else wants you to make a decision, the slower you should do so. Their desire for you to decide quickly is more than likely to benefit themselves. More than enough reason to step back and analyse further. As for the company you mention, I fully understand why under-performing businesses can be a great buy and you’ve already spotted their attempts to ‘polish the turd’, but my biggest question is, if you were to take it over, can you turn it around? If the answer isn’t close to 100% “yes”, then move on. Is that your strategy here or have you already dropped it? I haven’t dropped the business from consideration yet. I am asking for some additional information just to verify that I’m not being overly critical. But it’s pretty low on my list as of right now. I tend to build a case around my gut instinct by attributing more value to facts that support my gut and dismissing those that don’t. I’ve just accepted that behavior and now just prepare myself to accept whatever decision I have made without regrets. I think that’s the key, Julie. As long as you know your tendencies, you can build a system around them.